Solo sailors Armel Le Cleac'h and Alex Thomson and their IMOCA60 passed the Kerguelen Islands in 1st and 2nd position of the Vendée Globe and the French Navy was there to wave them off. Fantastic to see their gorgeous yachts fly away and relieving to hear calm and focused skippers on the radio! "I think this is the point of tack where there are the most airborne"
Modern day explorers from the Arctic nations of Canada, Denmark, Finland, Iceland, Sweden, Norway, Russia, and the United States are setting their sights north to map the seabed and establish sovereign rights to resources in an icy area that just over a decade ago was virtually inaccessible. Coastal nations have sovereign rights to ocean resources that extend 200 miles past the country’s coastline. Under the Law of the Sea treaty, coastal nations may also claim resources discovered if the extended continental shelf (ECS) of the nation extends past the 200-mile exclusive economic zone. “The convention allows the opportunity for a coastal state to extend sovereign rights over its resources of the seafloor and sub-seafloor far beyond what every coastal state is entitled to,” said Dr. Larry Mayer, director of the Center for Coastal and Ocean Mapping. 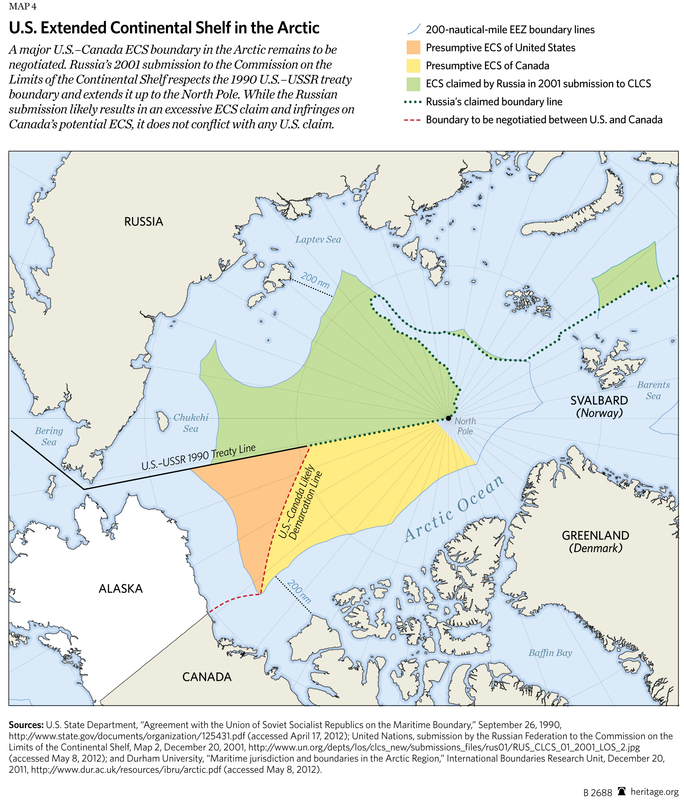 Congress has charged Mayer and his team from University of New Hampshire’s (UNH) National Center for Coastal and Ocean Mapping with mapping the areas of the Arctic where the U.S. has potential rights to extend its continental shelf. He has worked closely with the U.S. Coast Guard since 2003 to have access to a platform capable of breaking and transiting through ice, while also supporting the scientific equipment needed to gather data on the ECS. The premier asset for the job is Coast Guard Cutter Healy, the service’s most technologically advanced polar icebreaker, homeported in Seattle, Washington. “The Coast Guard has been an amazing collaborator in everything we’ve accomplished, and provided us with a spectacularly unique asset we are fortunate to have access to,” said Mayer. 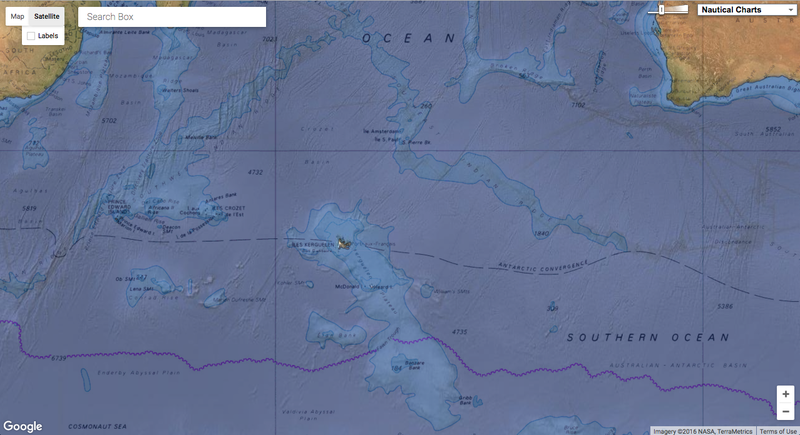 During Mayer’s first cruise with Healy in 2003, they discovered a 10,000-foot high seamount approximately 400 miles north of Barrow, Alaska, which they named the Healy Seamount. “This is our ninth trip to the Arctic. Four years in a row, we actually did a two-ship operation with the Canadian icebreaker Louis St. Laurent,” said Mayer. Scientists aboard Coast Guard Cutter Healy monitor the depth of a dredge deployed off the back of the ship in the Arctic Ocean on Sept. 23, 2016. The computer screen shows a 3D model of the undersea cliff-face the dredge is retrieving samples from. U.S. Coast Guard photo by Petty Officer 3rd Class Lauren Steenson. The multibeam sonar is one of the key pieces of equipment scientists use aboard the Healy. Mayer described it as a very sophisticated echo-sounding system that puts together a 3-D picture of the seafloor that allows them to see if the seafloor meets the characteristics of the ECS. On a computer screen, Mayer showed a three-dimensional, colorful image resembling a mountain range. The different colors correlate with the depth of the ocean. These mountains and canyons on the seafloor are what the multibeam sonar charts through the echo-sounding technology. Over the past eight years of studying the Arctic seafloor, Mayer and his team have mapped more than 164,000 square miles of previously inaccessible waters. This summer, the destination was a previously mapped underwater valley to determine whether the canyon is part of the continental shelf. “What we’re looking for is this big valley so we can dredge its steep walls,” said Mayer. Crewmembers aboard Coast Guard Cutter Healy prepare to deploy a dredge in the Arctic Ocean on Sept. 23, 2016. The dredge collected rock samples from outcrops of a seafloor canyon. Just after a pink and orange sunrise over ice covered waters on Friday, Sept. 23, the bundled up Healy deck crew gathered on the fantail to deploy the steel dredge with a crane. The crane slowly lifted the chainmail basket off the deck, boomed it overboard, and lowered it into the trench of open water broken by the bridge team that morning. In the aft conning room, the scientists kept their eyes on the depth and position of the dredge while the deck chief and first lieutenant monitored the safety of their crewmembers on deck. The cable attached to the dredge was more than a 1/2 inch thick, but the resistance of pulling the dredge up a cliff face through the water tightens and stretches the cable like a bungee cord. If it were to break under strain, it could whip through anything in its path. It was hours until they saw the dredge again. The scientists watched eagerly on deck in orange insulated suits waiting to dig through the muddy dredge basket like a Christmas present. The first rock they uncovered was just bigger than a softball. After dumping the contents out on deck, they started sifting through on their hands and knees finding more small samples, enough to fill a five-gallon bucket. Crewmembers and scientists aboard Coast Guard Cutter Healy empty the contents of dredge on deck to find rock samples in the Arctic Ocean on Sept. 23, 2016. The scientists recovered several rock samples from the mud. Then the equipment was reset, and the entire process was completed again. By evening, the deck crew had executed another successful dredge which yielded further valuable rock samples for the science members to study. He said that weather, ice, and distance are always the challenges faced when operating in the Arctic. 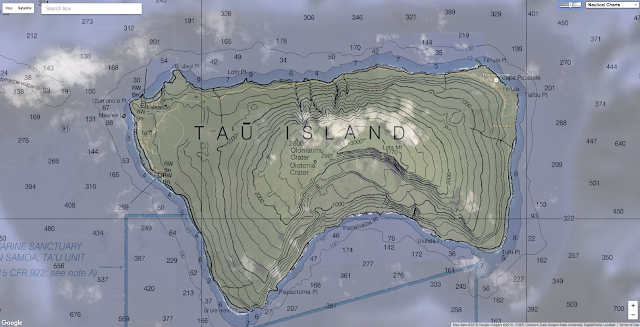 “We had some key mapping targets we’ve worked hard to accomplish. The dredge was a very high priority item for international collaboration,” said Mayer. The overarching goal of both the Canadian mission and the U.S. mission is to establish the limits of the ECS by determining the shape of the seafloor, thickness of the sediment, and the nature of the rocks. 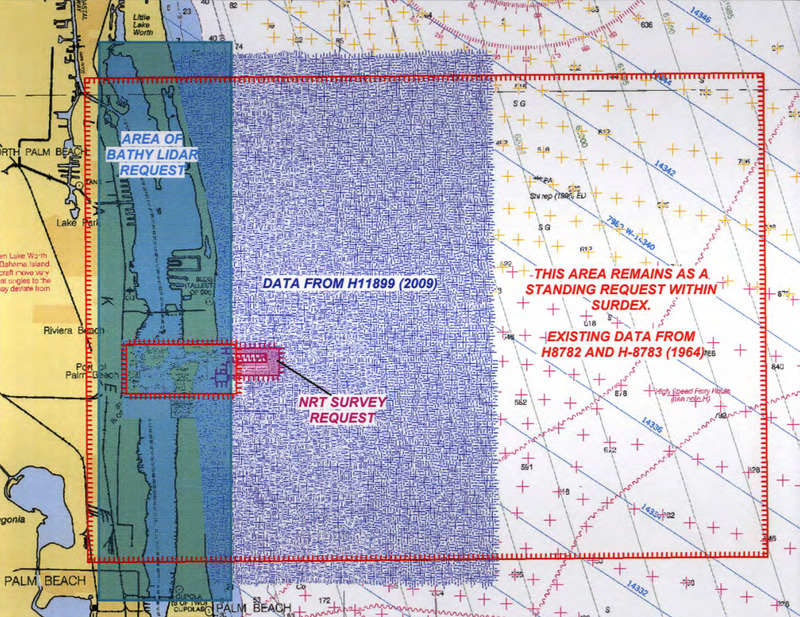 The mapping, seismic data, and dredging operations are pieces of the puzzle to determine if the limits of the ECS can be extended. A scientist aboard Coast Guard Cutter Healy holds up a rock sample from the Arctic extended continental shelf, Sept. 23, 2016. The rock was broken off the undersea cliff-face by the deployed dredge. All the collected samples will be delivered to the U.S. Geological Survey, the official curator of the samples. Then they are sent to Canada, or made available to Canadian scientists, to determine the nature of the rocks and ECS. The ECS for the U.S. and Canada are very close together, if not overlapping. The bottom line is that it is so challenging to work in the Arctic, Mayer said. Pooling resources and coordinating research with our neighbor saves both countries a tremendous amount of cost and effort, and that’s why we can work together and share information. Capt. Jason Hamilton, commanding officer, Coast Guard Cutter Healy, talks about the cutter's missions in the Arctic this year. U.S. Coast Guard video by Lt. Anastacia Visneski. Healy’s commanding officer, Capt. Jason Hamilton, agreed with Mayer that it is a privilege to serve the United States at the end of the planet. 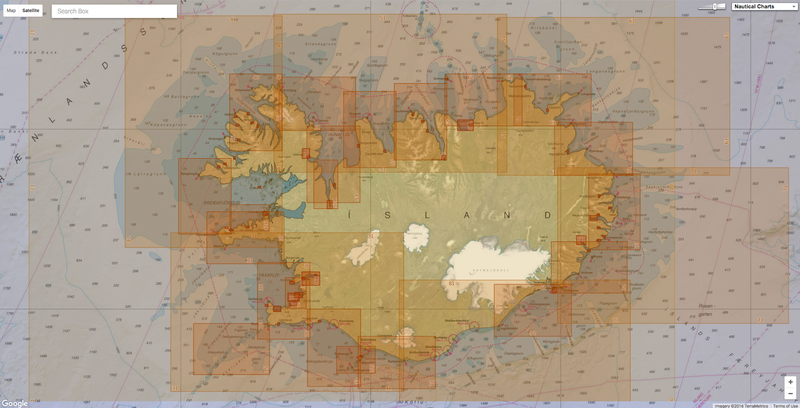 The overall attitude of this mission has been bittersweet between the excitement of exploring and researching the unknown, and the reality of why ships are now able to access areas this far north. Receding Arctic ice is opening up the area to additional claims to resources via the ECS, as well as increased commerce, transit, and touring. 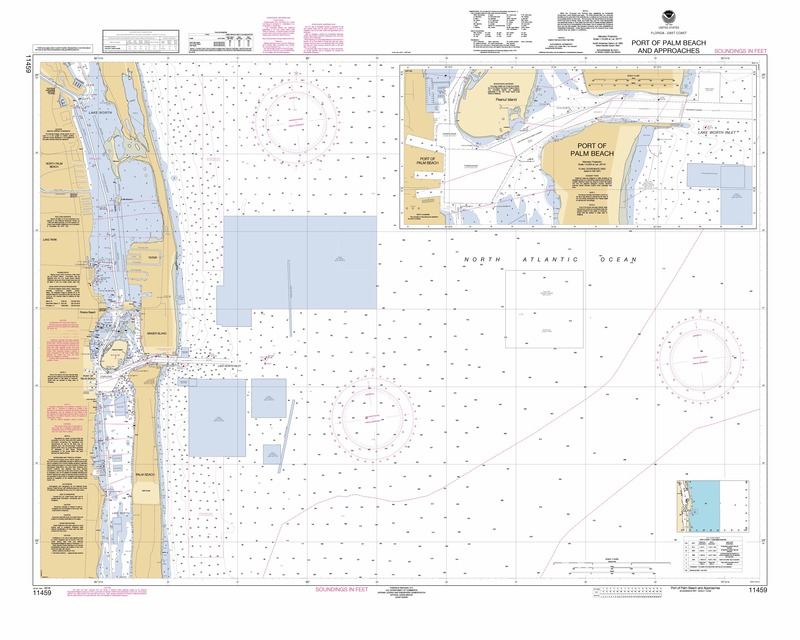 The need for precautions, protection, and safety of life at sea and ecosystem is paramount in the years to come. 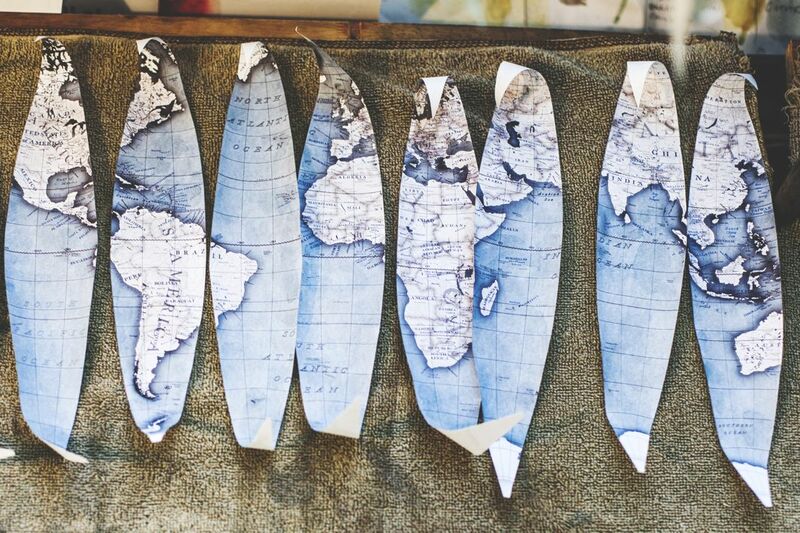 Peter Bellerby started making handmade globes in 2008, after a disappointing search for an 80th birthday present for his father convinced him to try a DIY approach. 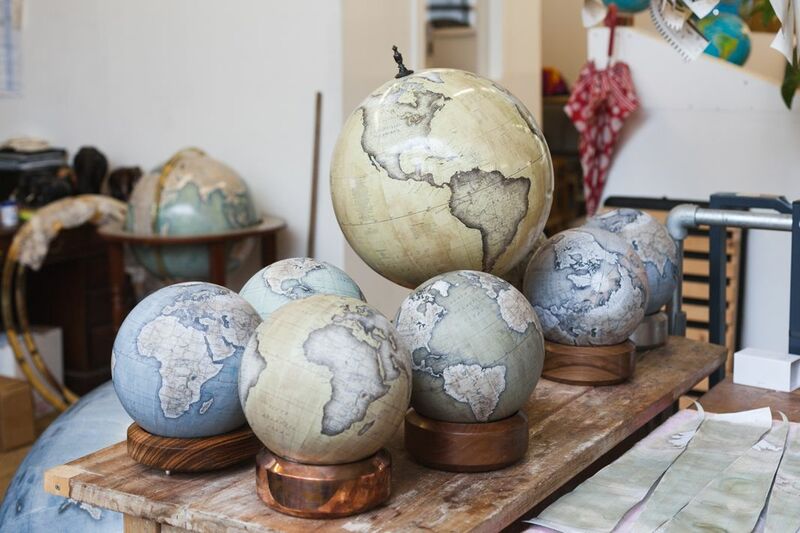 Now the London-based Bellerby & Co. manufactures painstakingly hand-colored artisanal globes with an Old World allure that utilize up-to-date cartography. 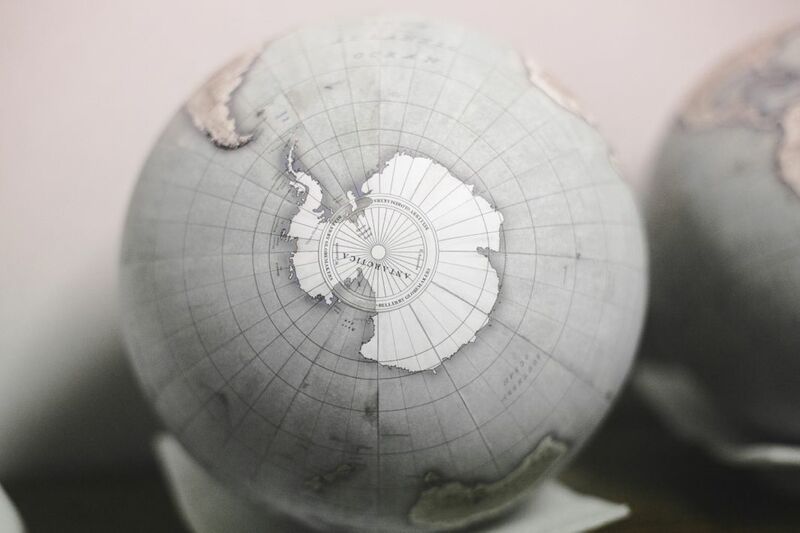 Their collection of high-end globes includes a mini desk version, and they create bespoke globes for individuals. Director Martin Scorsese commissioned two globes for the 2011 film Hugo, and the company’s work was showcased at a 2014 exhibition at London’s Royal Geographic Society. 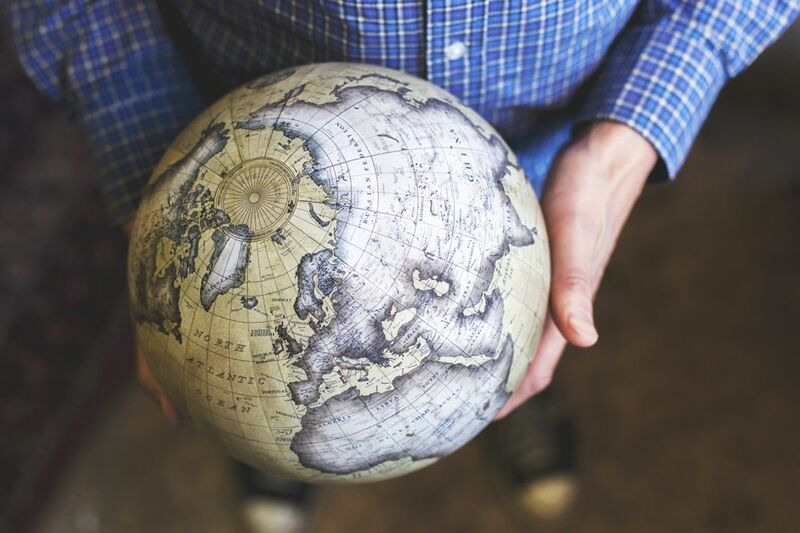 The self-taught globe-maker told me in an email that he spent 18 months of trial and error perfecting the process. 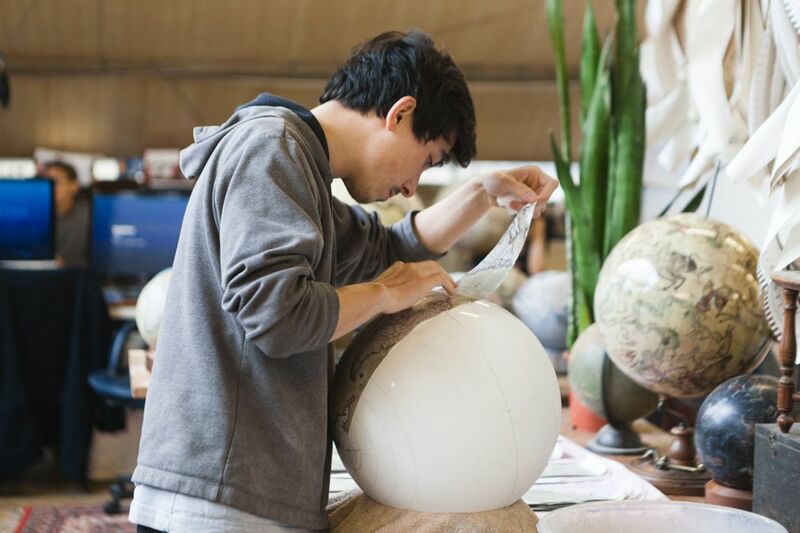 The hardest part of making a globe, he said, is applying the map to the sphere using papier-mâché. 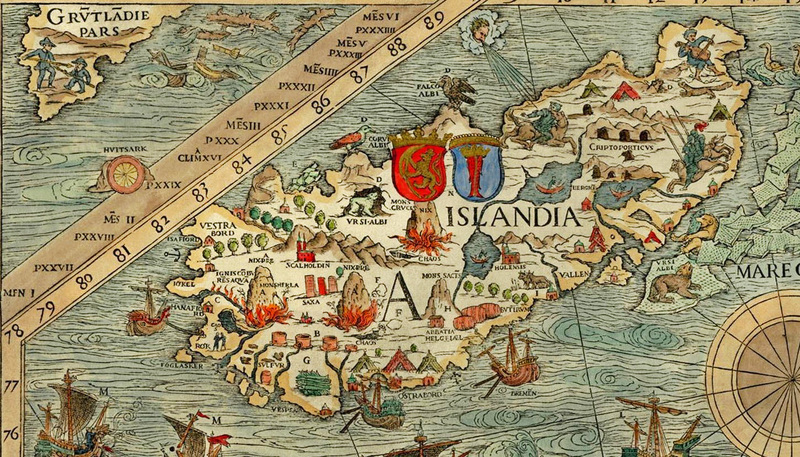 “In effect we wet paper and then stretch it, basically fighting the tendency of it to degrade, tear or turn to mush,” he said, applying gores—the name for paper segments used to make globes—so that latitude lines match up and preventing the kind of sloppy overlap that can wipe out entire countries, as often seen on poorly constructed models. Today Bellerby works with a full-time team of six that includes a globe painter and two apprentices. He said his design aesthetic is inspired by “the globes of several hundred years ago,” adding that each of the company’s globes are hand-colored, meaning every piece is unique. 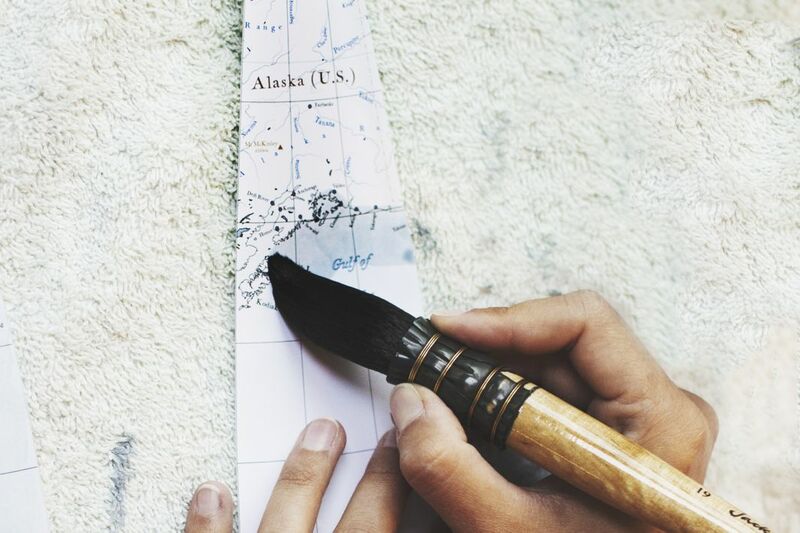 They edit cartography using Adobe Illustrator, placing letters individually to recreate the pleasingly irregular aesthetic that resulted when globe-makers of old used copper plates to place lettering by hand. While Bellerby acknowledges that there are plenty of people “making globes from their home basements, prop makers, hobbyists, children doing school projects, and of course people making plastic globes in factories,” he said that bespoke globe-making died out many years ago, with craftsmen taking their secrets to their graves. 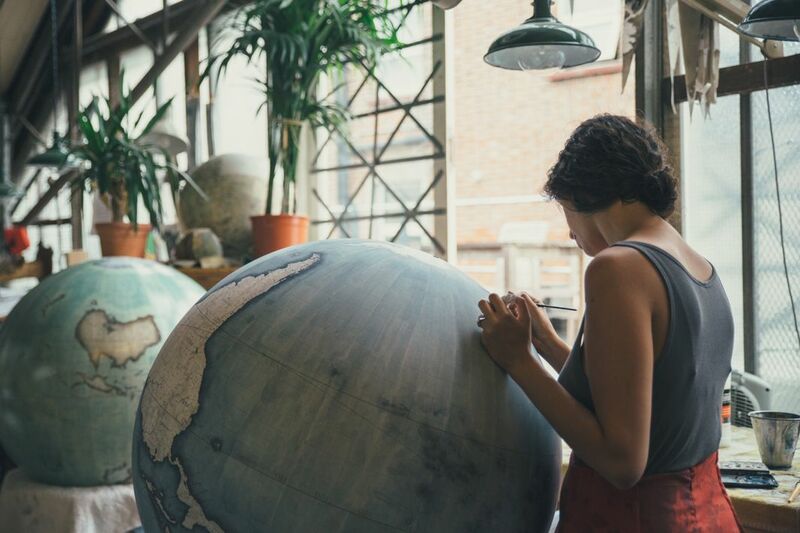 Bellerby claims that his company is “one of the last two handmade globemakers” in the world, and the only established company that uses traditional globe-making methods with constantly updated current cartography so that globes accurately reflect the moment in which they are created. Considering that there might be no other object more capable of capturing our earthly imaginations, why is Bellerby in such rare globe-making company? “I think the interest wasn’t there for a period of time,” he said. His work might cost a fortune, but Bellerby said that he aims to make robustly built globes that will last 100 years. “Our globes are not a throw-away item,” Bellerby said, adding that they use “the finest materials to ensure their longevity". 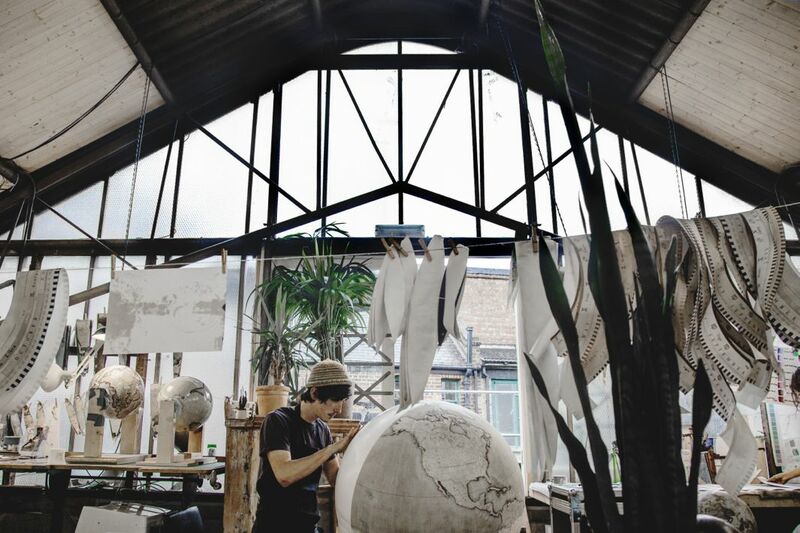 Check out the video below to listen to Bellerby talk about his process and have a glimpse into the inner workings of his London studio, or follow the studio on Instagram for more gorgeous globe images. Google invents a novel ship propelling system. It seems Google is expanding its footprint in the transportation industry, with a novel ship propelling system. A recently patent publication from Google shows that they have invented a new way to propel ships on water. It appears Google has shifted their sights from land to sea with a new innovation that makes with the firm's vision of floating data centers one closer to a reality. A recent patent describes a vehicle-based ‘windmill’ system with a range of rotors and rotating blades on its wing, capable of generating enough power to run and cool down the massive servers. 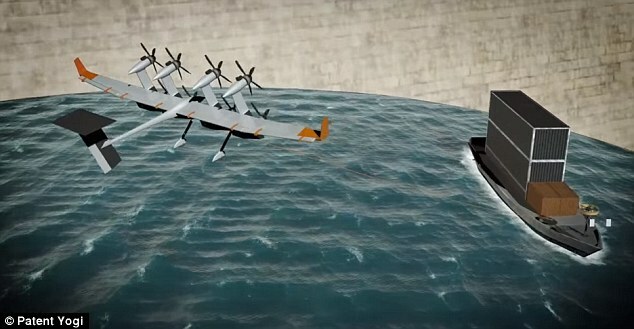 The tech giant suggests putting these flying turbines on their 'ocean-going vessels' with an electrically conductive tether, which would produce power while flying and propel the ship through the water. The patent, first spotted by Patent Yogi, was filed in May 2016 and is named ‘Airborne rigid kite with on-board power plant for ship propulsion'. It also lists three inventors who are kite engineers with the firm Makani Power, which was acquired by Google X in 2013. 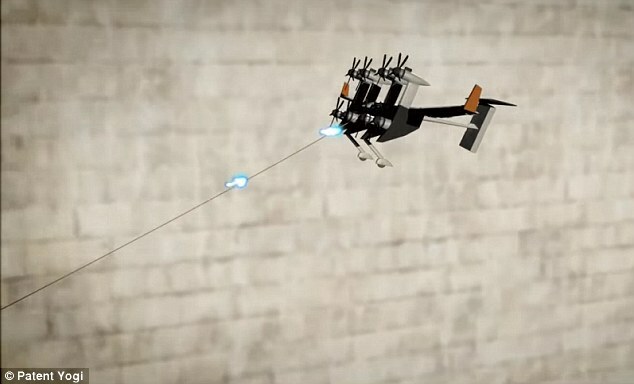 Makani Power stated that the ‘energy kite’ has the potential to generate 50 per cent more energy while eliminating 90 per cent of the materials used and for half the cost of conventional wind turbine. Now, it appears Google X is putting the technology to good use and combining it with their vision of floating data centers, which Google patented in 2009. 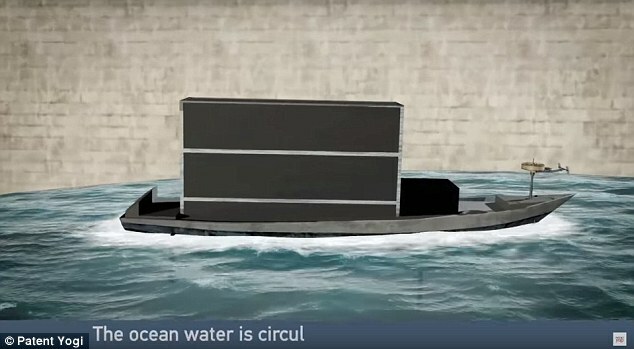 The document describes an environmentally-friendly sea-powered telecommunications and storage system that looks much like the vessels that have appears on both side of the continent. 'A system includes a floating platform-mounted computer data center comprising a plurality of computing units, a sea-based electrical generator in electrical connection with the plurality of computing units, and one or more sea-water cooling units for providing cooling to the plurality of computing units,' Google wrote in the patent. Kites aren't just toys anymore. 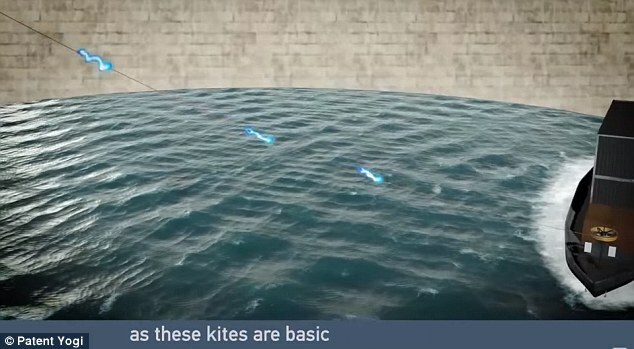 Makani's energy kite is an improved wind turbine, generating more energy, with less materials, and at lower costs. The ‘windmills’ would save Google money, as the firm spends billions of dollars each quarter to power the servers. 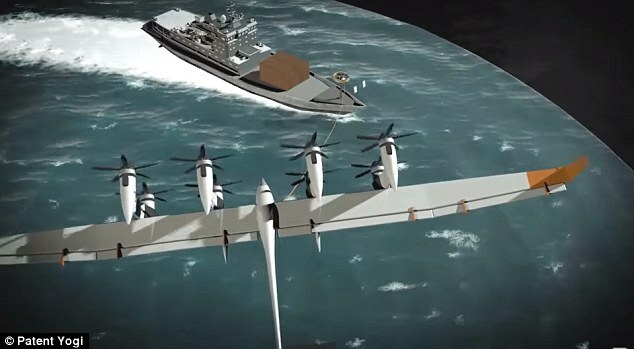 The team believes these kites, or windmill system, could generate free power on the ship, which could also be stored for emergencies or during bad weather. ‘Conventional wind turbines typically include large turbine blades positioned atop a tower,’ reads the patent. ‘An alternative to the costly conventional wind turbine towers that may be used to harness wind energy is to use an aerial vehicle attached to a ground station with an electrically conductive tether’. The patent, first spotted by Patent Yogi , was filed in May 2016 and is named ‘Airborne rigid kite with on-board power plant for ship propulsion'. ‘Such an alternative may be referred to as an Airborne Wind Turbine or ‘AWT’’. The patent explains that an AWT includes a rigid wing with mounted turbines, which flies between 250 and 600 meters in the air – or in this case, over water. This system is then linked to a ground station on the ship via an electrically conductive tether that gathers the energy produced by the device, which ‘may then be used for propulsive or auxiliary purposes’. ‘During launch, the aerial vehicle may operate in a hover mode, with the fuselage generally perpendicular to the grounds, the rotors may operate in thrust generating mode,’ according to the patent. Google continues to explain that this system ‘may lead to significant fuel savings and reduction in carbon dioxide emissions. When Google acquired Makani Power in 2013, Peter Fitzgerald, Google’s UK sales director, said the turbines could also save on construction costs. Speaking at the Cheltenham Literature Festival, he said the turbines could spell a solution to the world’s energy problems. He said: ‘It can make a big difference when it comes to energy. ‘It is tethered, has wings and if you go to high altitude flying around bringing energy. With the tethered turbines, he added, you could use them on ‘double the amount of land’. He admitted: ‘It’s kind of out there. 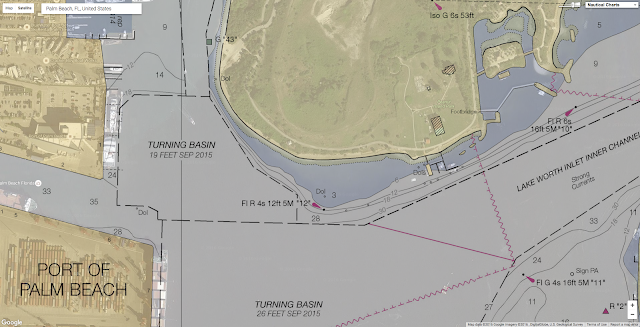 CNET : Is Google building a hulking floating data center in SF Bay? A large pool of melt water over ice on top of the Beaufort Sea in the Arctic Ocean. Danish and US researchers monitoring satellites and Arctic weather stations are surprised and alarmed by air temperatures peaking at what they say is an unheard-of 20C higher than normal for the time of year. In addition, sea temperatures averaging nearly 4C higher than usual in October and November. Temperatures have been only a few degrees above freezing when -25C should be expected, according to Francis. “These temperatures are literally off the charts for where they should be at this time of year. It is pretty shocking. 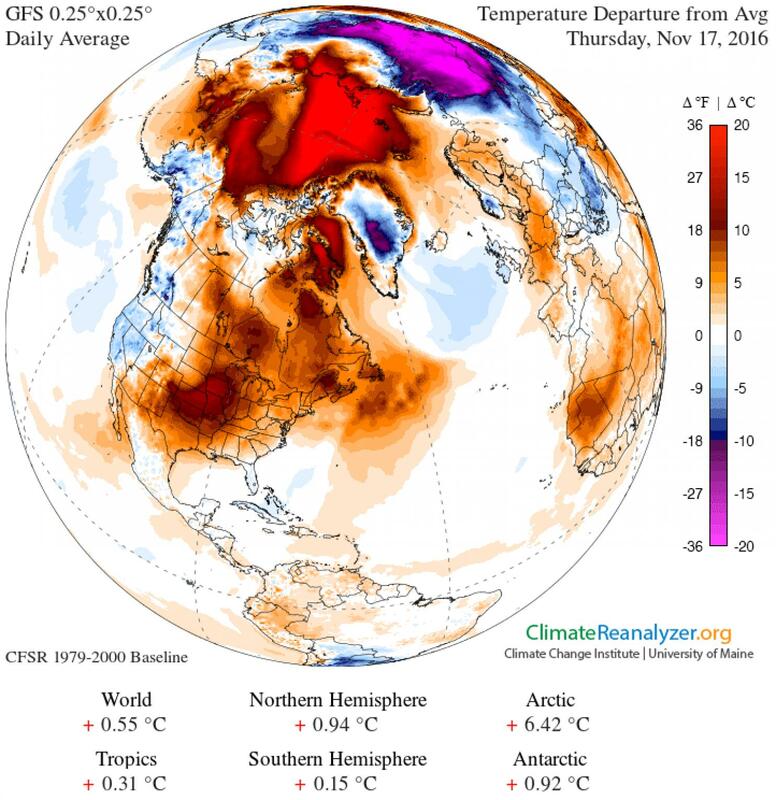 The Arctic has been breaking records all year. It is exciting but also scary,” she said. Sea ice, which forms and melts each year, has declined more than 30% in the past 25 years. This week it has been at the lowest extent ever recorded for late November. 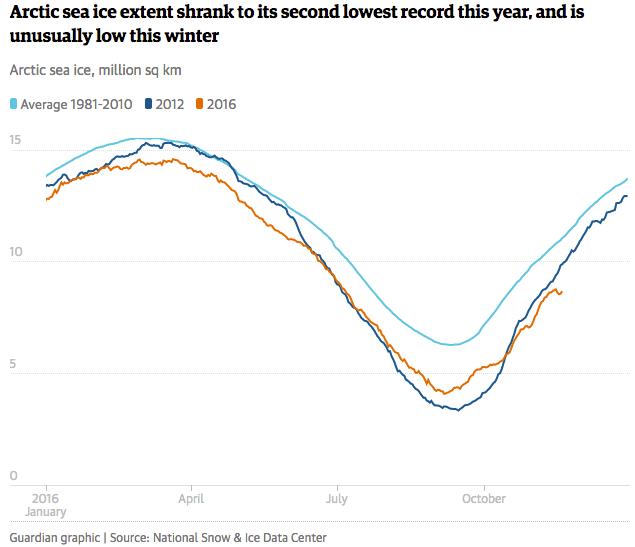 According to the US government’s National Snow and Ice Data Centre, (NSIDC), around 2m square kilometres less ice has formed since September than average. The level is far below the same period in 2012, when sea ice went on to record its lowest ever annual level. Francis said she was convinced that the cause of the high temperatures and ice loss was climate change. Rasmus Tonboe, a sea ice remote sensing expert at the Danish Meteorological Institute in Copenhagen, said: “Sea surface temperatures in the Kara and Barents seas are much warmer than usual. That makes it very difficult for sea ice to freeze. Time lapse of the relative age of Arctic sea ice from week to week since 1990. The oldest ice (9 or more years old) is white. Seasonal ice is darkest blue. Old ice drifts out of the Arctic through the Fram Strait (east of Greenland), but in recent years, it has also been melting as it drifts into the southernmost waters of the Beaufort Sea (north of western Canada and Alaska). based on data provided by Mark Tschudi, University of Colorado-Boulder. Julienne Stroeve, the professor of polar observation at University College London said ice that should be growing at this time of year was retreating. “It’s been a crazy year. There is no ice at Svalbard yet. In the last few days there has been a decline in sea ice in the Bering sea. Very warm air has flooded into the Arctic from the south, pressing the ice northwards. The significance of the ice forming late is that this affects its growth the following year, with consequences for climate. “Extreme wind and high air temperatures [now],” she said, “could see ice extent drop next year below the record 2012 year”. Last week the Barents sea reduced its ice cover. There was less ice at the end than the start.